At PPG, we are a business of transformational leaders. Our leaders constantly see people in roles and in positions of leadership who are unprepared to be the leader they need to be personally and professionally. They are unprepared to develop and lead others effectively because they are unable to lead beyond their own limitations. From Learning About to Learning to Become: We have devoted our lives as leaders to designing and delivering development programs that enable people at any level to get beyond learning about leadership to learning to become leaders. The most uncommonly effective people become in life what others simply try achieve through activity. Our programs are based on knowledge and experiences we have gained from many years of studying great leaders from history and from our years of developing the performance of key people everywhere. The Difference: The difference between where you are today as a leader and where you can be is small. 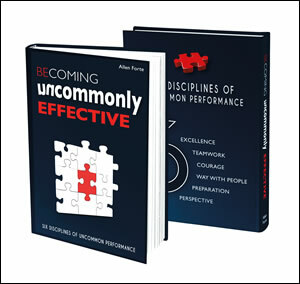 Uncommonly effective people have learned that by transforming one bad attribute they can gain development in multiple great attributes in return. They are disciplined by the six disciplines of development to give up something about themselves in order to gain something greater. What are you willing to give up in order to gain what is unattainable right now?